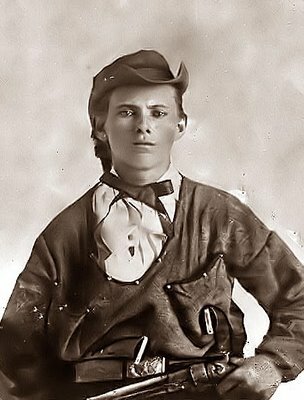 Keeping up with my Drag King theme of late, here's a photo of Old West outlaw Jesse James taken in 1864, aged 17. He radiates teenage swagger, and looks like such a girl. I saw this photo in a documentary and was so taken with it that I had to track it down. He's wearing a weird leather pull-over hunting jacket, with ammo pouches for breast pockets, over a clean white shirt and Colonel Sanders tie, and accessorized with a huge 6-gun. Behind his head on the left, it might be long hair or possibly a fox tail or raccoon tail hanging jauntily off the back of the hat. His hat looks so manhandled, I love it. The shape has been totally battered and distorted, the brim flips way up on either side, I imagine from frequent and none-too-gentle pinching of the sides of the hat as he has taken it on and off. And the point of the brim sits asymmetrically on the head in front. Kind of piratical, no? Tricia I thought he was a girl at first. Lol. What a great pic. I too am intrigued by this photo...and his distatseful life.